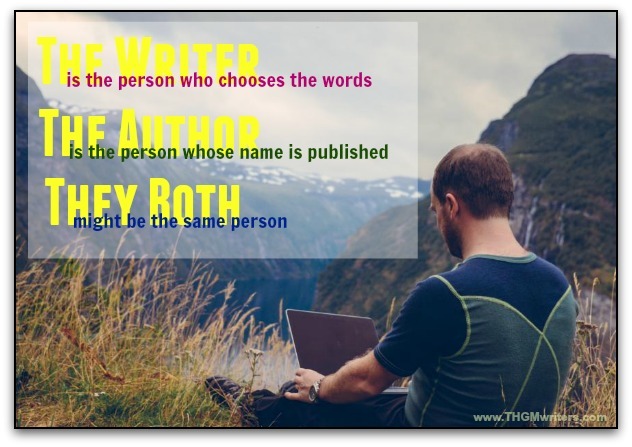 What is the difference between a writer and an author? Well…it’s complicated. Running a ghostwriting agency, I get this question all the time. “What is the difference between a writer and an author?” It is an important distinction to be made on a practical level, if for no other reason because our ghostwriting contracts sometimes make the distinction. In the real world, the debate rages on, too. Often the distinction is between having a published work, which makes you an author, and writing, which makes you a writer. Just for the record, that would mean that as soon as you start writing, you become a writer. As soon as you publish, you become an author. As soon as you stop writing, you cease to be a writer. However, you go to your grave an author, and five centuries later you remain an author. You cannot shake the title. You cannot outlive authorship. When they round up all the authors in the next military purge, you cannot disavow being an author. Once you publish, you will forever be known as an author. Or as Dean Wesley Smith puts it: “A Writer is a person who writes. An Author is a person who has written.” That is called “advanced conjugation”. A writer is a person who writes. An author is a person who has written. But all this discussion assumes that the author of a work and the writer are the same person, that authorship is a subset of…um…writership?. This is not always the case. Enter the ghostwriter. A ghostwriter is a writer, pure and simple. The ghostwriter writes, but does not publish. The ghostwriter does not affix his name to the work as author. The ghostwriter is paid a fee to write the work, then walks away. His client would typically be the author. The author is the one whose ideas are being written. The author is the one who either writes the work or hires somebody to write it for him. The author is the one whose name goes on the work. It does not matter whether the author ever picked up a pen or tapped on a keyboard. If he commissions a work and hires a ghostwriter, he is the author of the work. Even if he never publishes it, he is the author of the unpublished manuscript. In our contracts, when we refer to the writer, it is the paid help. This applies to books and screenplays, as well as to articles, reports, press releases, speeches and whatever other work the client wishes us to write. The client is the author. The writer is the writer. Simple enough? And if you write for a living, and you attach your name to what you write, you are an author. To this, I say, “Meadowmuffins!” Steve Hawking writes about science. More specifically, he writes his thoughts about science, what he believes is important, how he feels we might better understand science, the theories that he believes to be true, etc. Original though does not have to be imaginary. Original thought is the foundation for discovery. Two biographies of Margaret Thatcher might read very differently, depending on the viewpoint of the authors (yes, the “authors”), whom they chose to interview, the aspects of her life they focus on and various other factors. Don’t let anybody tell you that you are just a “writer”, because it’s not a book or because they don’t think your work is important enough or imaginary enough or any other criteria somebody else wants to place upon you and your work. Authorship is not about what other people think of you. If you white-label your work, you are a writer. If you own-label your work, you are an author (and if you wrote it yourself, you are also a writer, of course). The byline defines the author. On one project you might be just the writer (a ghostwriter). On another, you might be both writer and author. That’s fine, too. We all play different roles in our lives at different times and in different contexts. So now you know the difference between authors and writers. I would argue that much of science is fiction inasmuch as most of it is unproven theories rather than provable fact. Much of what we “know” isn’t true. “It ain’t what you don’t know that gets you into trouble. It’s what you know for sure that just ain’t so.” ~ attributed to Mark Twain (who most hopefully know was the pen name of Samuel Longhorn Clements”). If that was the case, Shakespeare might be his (or her) own ghostwriter…which would get as complicated as some of the scenes in “As You Like It”. There is a thin line between a writer and an author. In fact, it depends on the context of who is defining or comparing them. For me, a writer is an author and an author is a writer as long as an “original” idea is penned down! I got confused. But I liked the post. Now I’ll re-read and understand. I liked the idea Sunday of William it simple and understandable!